Sustainable development is an internationally recognised objective for governments, businesses and societies. However, how the private sector engages with sustainability in a systematic way through their business activities remains unclear. This book evaluates the sustainability practices of the private sector by utilising a sustainability assessment framework – a method for integrating different strands of impact assessment, to better inform decision making for the promotion of sustainable economic development. 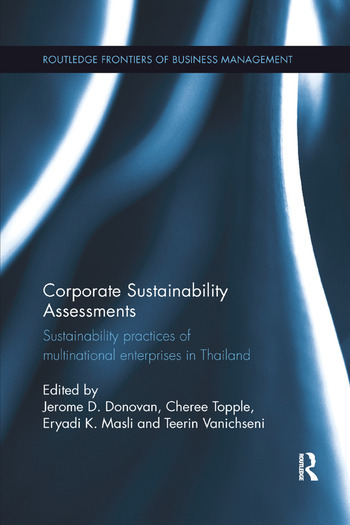 Through a sample of leading multinational enterprises (MNEs) in Thailand, this book provides evidence on the types of sustainability approaches being utilised by the private sector, shedding light on the important relationship between FDI and sustainable development. It also clarifies the role of FDI in sustainable development, and the methods, tools, and techniques that enable the private sector to engage with sustainability and sustainable development. The book will generate significant interest from sustainability practitioners in both the public and private sector. Jerome D. Donovan is Senior Lecturer in International Business at Swinburne University of Technology. He is also Principal Advisor for Technology Entrepreneurship and Commercialization Development with the Ministry of Science and Technology, Vietnam. Cheree Topple is Lecturer at the Department of Management and Marketing at Swinburne University of Technology. She has worked on a range of government-funded projects to support SME development in the areas of sustainability and human resource development. Eryadi K. Masli is Lecturer in International Business at Swinburne University of Technology. He is also Senior Advisor for the Ministry of Planning and Investment, Social Republic of Vietnam, and Senior Advisor in Economic Development for the Ministry of Planning and Investment, Lao People’s Democratic Republic. Teerin Vanichseni is Lecturer at the School of Business, and Director of the Center of Business Research and Case Study at the University of the Thai Chamber of Commerce.